When we meet our narrator, Harry London, he’s only got only one arm, and he’s alone in a remote cabin - drunk and depressed about something to do with his ex-wife. He’s visited by an attractive female named Jean Cummings whom he greets with suspicion and violence when she wants to hear his story. These opening scenes are a bit frustrating because the reader has no idea what’s happening or how Harry got into this position. Stick with it, though. You’re in for quite a ride. It’s midway through chapter five - about 15% into the paperback - that the flashback begins enlightening the reader about how London finds himself in such a bad place. I don’t want to give too much away, but there’s an infidelity, a murder, a frame-up, and a cover-up followed by a scheme to exact revenge. There are many clever plot twists here that you must read to experience. This a great book written by an author with clear literary aspirations and an ability to craft a plot utilizing prose far exceeding most of the era’s noir stories. Things get a bit melodramatic towards the end, but the quality of the writing never fails. 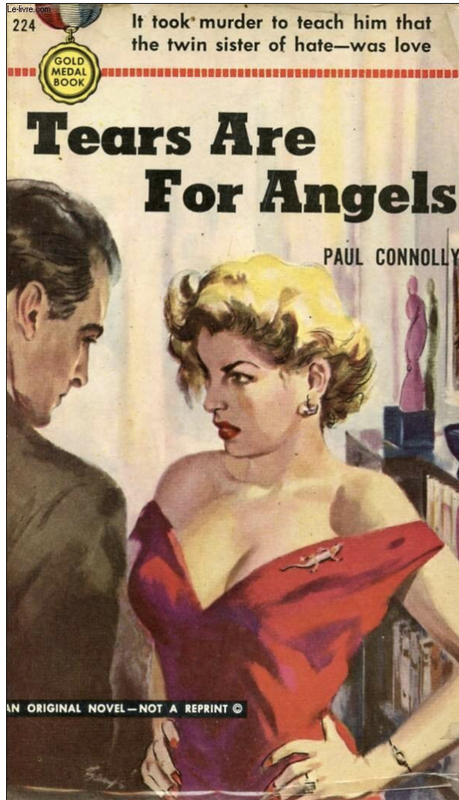 “Tears are for Angels” really is a quality work of forgotten noir fiction that hasn’t been legally reprinted since its release over 66 years ago. It would be a natural fit for a modern release at the hands of Stark House or Hard Case Crime. For the rest of us, it’s just great reading. Recommended.